December 5, 2017, New Delhi: After the highs of 2015 and the slow 2016, 2017 has been even slower for startups with a lot of them facing issues with raising funds and some of them even shutting shop. To ease the environment, Government of India is reportedly reviewing the tax regime for startups, with the aim of attracting more entrepreneurs, but as it currently stands, startups and SMEs do face some challenges. 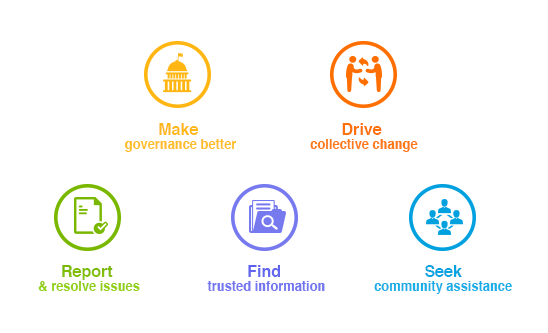 LocalCircles conducted a survey amongst 33,000+ startups and entrepreneurs from different parts of India to find out how the Startup India Mission was going for them and the different roadblocks they were facing in making their startups successful. The set of 9 polls garnered more than 24,000 responses from across the country and highlighted the issues startups face while operating in India and the outlook. In the last 1 year, the Government has shown intent towards making the Indian ecosystem conducive for startups to bloom and survive. 20% startups said they have benefitted from the Startup India Mission but the last year has not been easy for them. Many of them have reported getting frequent tax notices due to fund raise, change in valuations etc. thereby leading to entrepreneurs spending significant time in tax offices and on compliance related matters. Some startups like Flipkart, Grofers, InMobi have decided to move their registered office from India to Singapore as their they have to pay less in taxes, spend lesser time on compliance and get access to better funding opportunities. Startups have also said that they use digital advertising services from global companies like Google, Facebook, Twitter and these companies bill Indian companies from their foreign offices due to which startups are forced to pay a 6% equilisation levy on top of the invoice value as their billing entity is not registered in India. There is a strong demand that these companies are mandated to bill the Indian companies from their Indian offices so that the dual-taxation could be stopped. This will directly lead to less financial burden on Indian startups. Many tech Indian startups who procure services like hosting, database retrieval, pay per use services from global majors have to pay 18% GST under reverse charge. If the same startup is registered in Singapore they would not be subject to such a high tax which is significant for pre revenue startups that rely on founder savings or small investment from angel investors. The whole GST reverse charge on foreign services used by startups goes against the Startup India mission as Indian startups need to go to foreign countries for services and expertise in new areas. A comparatively good percentage of startups also said that their state government has eased out rules for starting up and hence made doing business easier compared to last year. 31% of them also said that introduction of GST has had a positive effect on their businesses. Foreseeing the problems in the coming year i.e. 2018, they feel that corruption and bureaucratic inefficiencies will be the biggest issues they will have to face when they look to expand and grow their business. However, as optimistic as Indian entrepreneurs are, 78% expect to grow their business in 2018. 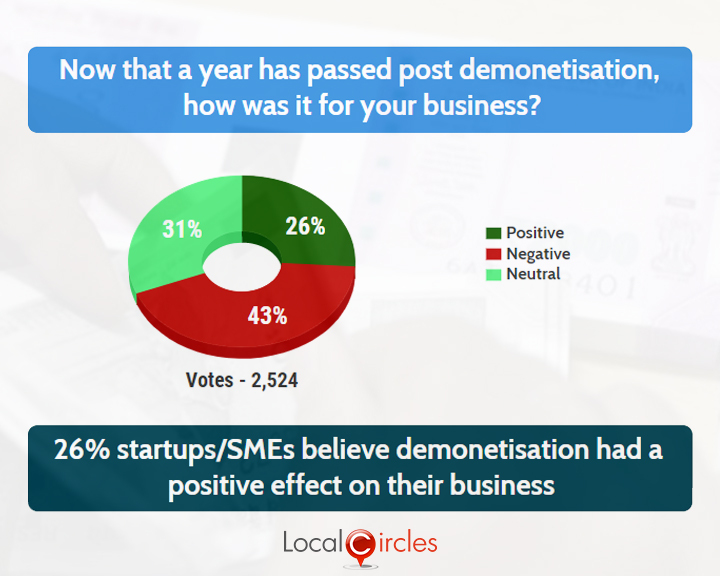 The first poll asked startups if their business had benefitted in any way as a result of the Startup India Mission launched in January 2016. 20% have said that their Startup has benefitted from the Startup India mission since its launch 2 years ago. 38% respondents in the second poll said that their state had made it easier to do business than before and 43% said the situation was more or less the same as before. 19% said their state had made it harder to do business than before. The third question asked about the impact of demonetisation on their business. 26% said it was positive and 43% said it was negative. 31% said it was neutral for them. In the poll on GST impact, 31% startups and SMEs said that GST has had a positive impact on their business while 41% the effect was negative. 28% said there was no effect. Indian technology startups in many cases have to go to overseas suppliers to procure new technologies, services and expertise and these transactions are currently taxed at 18% GST (under Reverse Charge Mechanism) putting Indian startups at a disadvantage against their global counterparts. The fifth poll asked if such transactions should be exempt from GST. Not surprisingly, 100% respondents agreed with this. Facebook, Google, Twitter and other advertising platforms bill Indian startups from overseas offices and startups are forced to pay an equalisation tax/levy to authorities in India. 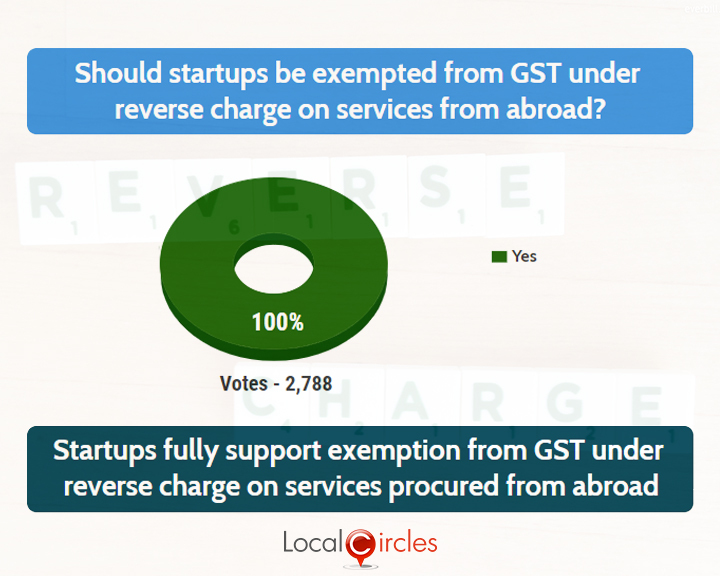 The next poll asked if the Indian government should make billing from Indian offices of these foreign companies mandatory for customers in India so startups don’t end up paying double taxes. 100% startups and SMEs agreed with this too. 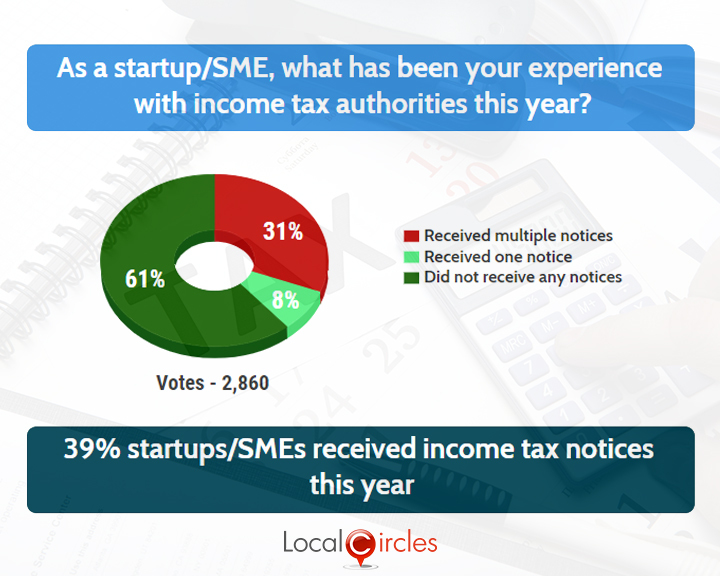 The next poll, startups and SMEs were asked how their experience was with the tax authorities in the last one year. In response, 31% said they received multiple notices, 8% said they had received just 1 notice and 61% said they did not receive any notice. 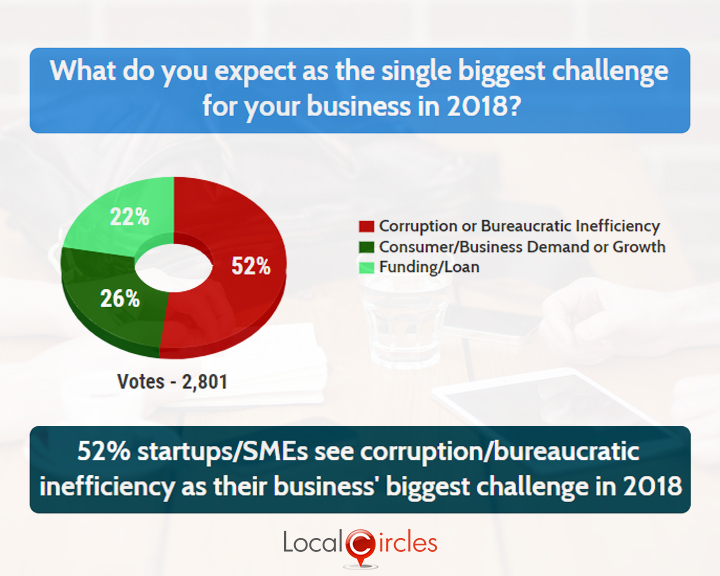 The penultimate question asked what they expected to be the single biggest challenge for their businesses in 2018. 52% said it would be corruption and bureaucratic inefficiency, 26% said it will be consumer/business demand or growth and 22% said it would be finding new loans and funding. In the final question, SMEs and startups were asked what would they ideally like to do with their business in 2018. 78% said they would like to grow it, 11% said they would sell it and 11% said they would in all probabilities, close their business. • One year of Startup India - What Startups/SMEs want in 2017?